The Red Flag Campaign is a public awareness campaign that addresses dating violence and sexual assault on college campuses. The campaign uses a positive strategy to help promote healthy relationships. That is, the focus is on bystander intervention. It encourages people to "say something" if they see "red flags" or warning signs of abuse, or sexual violence in friend's relationships. Many times people want to "stay out of it" or "ignore" abusive behavior. The Title IX Office at Hampton University wants people to "Say Something" and stand up against sexual assault and domestic violence because statistics show that dating violence happens in 1 out of 5 intimate relationships in college. BThe poster series featured "Red Flags" with scenarios and issues that might be present in a relationship with dating violence. The themes included, Coercion, Emotional abuse, Sexual assault, victim-blaming, excessive jealousy, isolation and stalking. The Center for Sexual Assault Survivors and Transitions Family Violence Services partnered with the Title IX Office at Hampton University to promote its available services to victims, provide informational literature, and to encourage healthy relationships to students. The Title IX Office at Hampton University sponsored the event which included a "selfie stand" up in the Student Center Atrium with the hashtag… #RedFlagCampaign. Students and the Hampton University community were encouraged to take a picture behind the "selfie stand" and use social media to show support for healthy relationships! The campaign generated impromptu discussions on what to do and say when encountering the "red flags" with a friend's relationship. 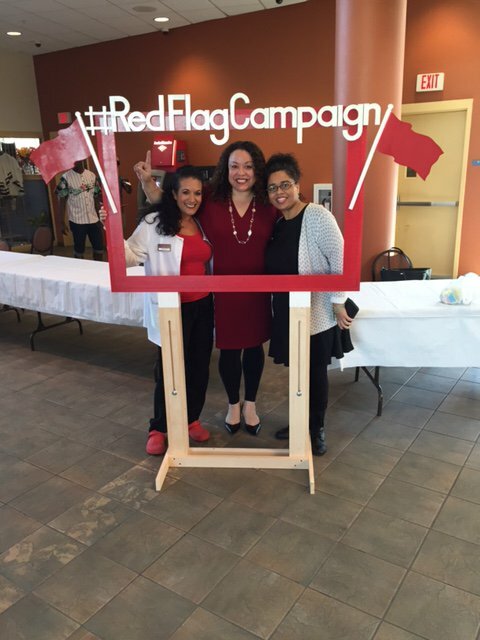 Hampton, Va. — The Hampton University Title IX Office hosted a "Selfie Stand" and information table in the Student Center Atrium to raise awareness amongst students about the "Red Flag Campaign.". Hampton University strives to provide the safest environment for which its students can learn and excel. 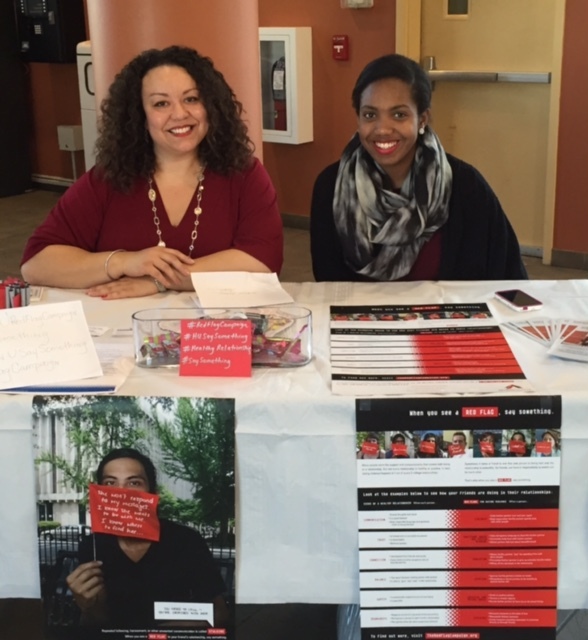 HU’s Title IX Office and its coordinator, Kelly Harvey, in association with the Health Center, hosted “The Red Flag Campaign” in HU’s Student Center to help eradicate dating violence on college campuses and spread awareness in the Hampton Roads community. The campaign is a project of the Virginia Sexual and Domestic Violence Action Alliance (VSDVAA), and was created by college students, college personnel, and community victim advocates. HU is one of the featured campuses in partnership with the VSDVAA. Research conducted by the VSDVAA indicates that in 1 in 5 college students experience dating violence. The Red Flag Campaign uses a bystander intervention strategy to address and prevent sexual assault, dating violence, and stalking on college campuses. The campaign encourages friends and other campus community members to say something when they see warning signs ("red flags") for sexual assault, dating violence, or stalking in a friend’s relationship. "This campaign is focused on healthy relationships and encourages and educates students to recognize the "red flags" of an unhealthy relationship," said Kelly Harvey HU Title IX Coordinator. "If they "see something" we want them "say something". We were promoting people taking pictures behind our "Selfie Stand" and using our hashtags to promote that they support it!!!" For more information about the “Red Flag Campaign” or Hampton University Title IX Office contact 757-727-5426. In an effort to bridge the gap between the Administration and Students, the Title IX Office at Hampton University, along with a committed group of students, formed the Red Flag Campaign Taskforce. This student-led taskforce was formed to promote awareness and educate students on the problem of sexual assault on campus. In partnership with the Title IX Office at Hampton University, this taskforce will work diligently to revitalize the existing Red Flag Campaign here on campus. The Red Flag Campaign is a national campaign that is promoted bythe Title IX Office that uses a bystander intervention strategy to address and prevent sexual assault, dating violence, and stalking on college campuses in a proactive manner. The campaign encourages friends and other campus community members to say something when they see warning signs, or the "red flags" of an unhealthy relationship which could involve sexual assault, dating violence, or stalking. As a task force, our main priority is you, the student body. As our priority, we pledge to approach your concerns with empathy, sensitivity, and diligence. As a task force, we are building a positive rapport with the Title IX Office that benefits you, the student. As a result of meetings that have already taken place, initiatives have been created that will go into effect immediately and be visible on campus. Though we are members of the task force, we strongly encourage you all as the student body to inform us of your personal concerns and ideas that can help improve the climate on campus. While neither legal information nor specific case information can be released by the Title IX Office, the taskforce assures you that we will work together with the Title IX Office to bring you new student focused initiatives that promote a united mission of encouraging healthy relationships and ending sexual assault and sexual misconduct on campus. Please understand that this is a step in the right direction and resolution will not come overnight, but we are diligently working on your behalf. In the spirit of taking immediate action, the Title IX Office has given the taskforce the freedom to plan and promote activities for the Red Flag Campaign week that will take place March 19 -23, 2018. This week will highlight the topics covered under Title IX, including dating violence, sexual assault, sexual misconduct, and stalking. We would like to thank the Administration, the Title IX Office, HUPD, the Student Government Association, and others for their sense of urgency in assisting us as we work together to implement new initiatives that will benefit the student body. We would also like to thank the student body for their activism, persistence, and passion. We encourage students to maintain enthusiasm so we can shift the narrative and create positive change.